Competition was fierce this last Thursday as the Bocce ball summer league began. Team Grayson/Rachel displayed the precision of surgeons as they dominated the field, finishing the night with a perfect record. Team Crystal/Jessica also finished the evening with a perfect record… ending the night with zero wins. Overall everyone had a ton of fun, and lots of laughs. 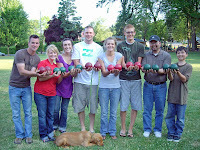 Bocce ball play will continue at 6 p.m. this Thursday night at Hammerle Park. All are welcome to come and play. Bring your set if you have one and spectators are definitely encouraged. If you think you have what it takes to withstand the intense pressure and fierce competition of the Bocce ball summer league get a partner and join us for a really fun time.